Qatar Tuesday reiterated its support to the Palestinians and to Gaza people pointing out that it will continue assisting in the reconstruction effort despite its isolation by other gulf countries, among which Saudi Arabia, United Arab Emirates, Bahrain and Egypt. Qatar in 2014 pledged $1bn for the reconstruction of Gaza following the war between Gaza-ruled Hamas and Israel. It was the largest pledge of donors. Qatar has been supporting development projects including housing and construction of hospitals in enclaved Gaza under Israeli siege for over a decade after Hamas took control of the Strip. 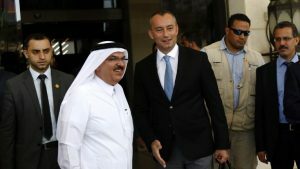 Speaking alongside Nickolay Mladenov, UN envoy for the Middle East in Gaza city, Mohammed al-Amadi who is Doha’s envoy to Gaza, indicated that Qatar was not in the Strip to support Hamas. “The policy of Qatar is to support the people and the official government. We do not support Hamas, we support Hamas as a part of the Palestinian people,” he said. Hamas is labeled a terrorist organization by the US, EU and Israel. Doha was blamed last month by Saudi Arabia and its clique for funding terrorist organizations including Hamas. Posted by KanelkaTagba on Jul 12 2017. Filed under Headlines, World News. You can follow any responses to this entry through the RSS 2.0. Both comments and pings are currently closed.